The changes resulting from Arctic warming would be bigger than you might expect at first sight, and would in many ways be unpredictable, because of the effect of positive feedback. Today, the shiny white surface of the ice covering the Arctic Ocean reflects away incoming solar energy, and helps to keep the polar region cool. Once the ice starts to melt, however, it exposes dark water, which absorbs the incoming solar energy and warms the region still further. If the world cooled for any reason, the feedback would operate in reverse, with dark ocean being covered by shiny ice that reflects away incoming solar energy and helps to keep things cold. But you can’t have half the north polar icecap; the feedbacks make it an all or nothing choice. This fact alone tells you that our distance from the Sun is not the cause of the seasons; in the Northern Hemisphere, we have summer when we are furthest from the Sun. But maybe the elliptical orbit produces other, more subtle effects on climate. In order to understand a given law, I was generally obliged to make myself acquainted with the preceding law or condition on which it depended. I remember well that, before I could make headway in physical astronomy… I had to go back and study the laws of motion and the fundamental principles of mechanics. In like manner I studied pneumatics, hydrostatics, light, heat, electricity and magnetism. I obtained assistance from no one. The environment suited him down to the ground. ‘I have never been in any place so congenial to me as that institution,’ he wrote. ‘My salary was small, it is true, little more than sufficient to enable me to subsist; but this was compensated by advantages for me of another kind.’ He meant the library, and the peace and quiet, allowing him to give rein to his ‘strong and almost irresistible propensity towards study’. The change in eccentricity is measured in terms of the distance between the two foci of the ellipse, as a percentage of the long axis of the ellipse. For a perfect circle, the two foci merge to become one, with no distance between them, so the eccentricity is zero. Today, the eccentricity of the Earth’s orbit is about 1 per cent, but Leverrier showed that at its most extreme the Earth’s orbit has an eccentricity of roughly 6 per cent. Because Leverrier’s calculations showed that the Earth’s orbit was in a more highly eccentric state 100,000 years ago, while for the past 10,000 years or so it has been in a low eccentricity state, and since the world is warmer now than it was in the past, Croll speculated that some effect associated with high eccentricity must be responsible for Ice Ages. Leverrier’s calculations had already shown that whatever kind of orbit the Earth is in at any particular epoch, the amount of heat received from the Sun over the course of an entire year stays the same; but Croll followed up the idea that it might be the way the heat is distributed between the seasons which matters, since this is undoubtedly affected by the eccentricity. When the orbital eccentricity is low, and the orbit is circular, the amount of heat received by the whole planet from the Sun each week is the same throughout the year; but when the orbit is more elliptical, with high eccentricity, the Earth receives more heat in a week at one end of its orbit, closest to the Sun, and correspondingly less heat in a week at the other end of its orbit, farthest from the Sun. Depending on which hemisphere you live in, this may mean that when the orbit is more eccentric there is more difference between the seasons, with cold winters when the Earth is farthest from the Sun and hot summers when it is closest to the Sun; or (in the other hemisphere) it may mean that the eccentricity effect smooths out the difference between the seasons, keeping summers cool and winters mild. Croll argued that what was needed to build an Ice Age was a series of very cold winters, so that there would be more snowfall, building up white snowfields and ice sheets which would reflect away the summer heat from the Sun to keep the hemisphere cool. He was one of the first scientists to develop the idea of feedback in any context, and although it happens that he got the detail of this influence backwards, his model would be important historically for that reason alone. Croll was one of the first people to appreciate the major influence of the great ocean currents on climate, and was the first person to work out the link between the trade winds (essentially driven by convection in the atmosphere stirred up by the Sun heating the surface of the Earth) and the flow of these currents, pushed by the winds. He reasoned that the change in the balance of heat between the hemispheres when one polar region cooled would increase the strength of the trade winds, blowing from the hotter part of the world to the colder region in an attempt to even out the temperature, and also change their direction somewhat. This would change the pattern of the ocean currents. In particular, he noted that a relatively small shift in the westward flowing current of the equatorial Atlantic Ocean could make it flow either northward past the bulge of Brazil and up past North America, or southward past the bulge of Brazil, and down past South America. The potential climatic consequences of such a shift, which could be triggered by a relatively small outside influence, are clear from the Prologue. Once again, Croll was at the forefront of thinking about feedbacks, and the way in which they can magnify small initial disturbances. In his own words, he was ‘under the spell of infinity’. Milankovitch was based in Belgrade for the rest of his working life, and within two years he had found the problem that would occupy him for the next thirty years—but always, strictly speaking as a hobby, worked on at home, alongside his day job as a teacher and engineer. Milankovitch reckoned that he started out on the task, when he was thirty-two years old, at exactly the right time: Had I been somewhat younger I would not have possessed the necessary knowledge and experience… Had I been older I would not have had enough of that self-confidence that only youth can offer. Coffee (black) was served by Milankovitch’s wife promptly at ten o’clock, and occupied just ten minutes before it was back to work. Lunch at one was followed by a short siesta and a cigar, then more calculations until six, when work ceased for the day. A stroll before dinner, which was a leisurely meal taken at eight, where the family discussed the topics of the day, was followed by an early night, with bed at ten providing time to read (never anything related to work) for an hour before settling down, usually to think for a considerable time before sleeping. I was always intrigued by his method of work—never rushing nor delegating anything, including even drawing and translating into French or German. He always made thorough preparations by outlining relevant points before precisely detailing the body of the article, then rewriting prior to typing the final copy himself. A simple reply to any correspondence would be treated in the same personal manner. It was while watching the fighting that he suddenly had a flash of insight which showed him the way around the mathematical logjam that had been holding him up. It was a classic example of the way the answer to a problem you have been struggling with can pop into your head once you stop looking for the solution. But it was Koppen who pointed out that it is always cold enough for snow to fall in the Arctic in winter, even today, and that the reason that the Northern Hemisphere is not in the grip of a full Ice Age at present is because the ‘extra’ snow melts away again in summer. He reasoned that the way to encourage the ice to spread would be to have a reduction in summer warmth, because then less of the winter snowfall would melt. If less snow melted in summer than fell in winter, the ice sheets would grow—and once they had started to grow, the feedback effect of the way the ice and snow reflect away incoming solar energy would enhance the process. The best place to find out what the climate of the Earth was like in the past is at the bottom of the deep ocean. Different kinds of sea creatures flourish under different climates, and in particular at different ocean temperatures. Layer by layer, the mud of the sea bed builds up, and each layer contains the remains of the creatures best suited to the climate at the time that layer was being laid down. The solution was to drop hollow steel pipes vertically into the sea bed, so that their weight would drive them into the mud. When the pipes were hauled back on board ship, the mud inside the pipe could be extracted as a cylindrical core, with its layered structure intact. Unfortunately, because of the resistance of the water, which stops the pipes building up any great speed as they fall, this kind of ‘gravity coring’ can only extract cores about a metre long—the pipes just won’t penetrate any deeper into the ooze. This was better than nothing, and provided the first evidence, in the 1930s, for three distinct layers in this top metre of mud in cores from the tropical Atlantic—two layers containing remains corresponding to warm conditions like those in the region today, sandwiching a layer containing remains corresponding to a colder climate. The obvious candidate for that something else was the way water gets locked up in great ice sheets during an Ice Age. When water evaporates, it is easier for the lighter molecules to escape into the air, so the water left behind tends to have a higher proportion of oxygen-18; much of the evaporated water, relatively rich in oxygen-16 compared with the water left behind (exactly how rich also depends on the temperature), falls as snow during an Ice Age, and gets locked up as ice instead of being recycled back into the sea. So the proportion of oxygen-18 available in the oceans is higher during an Ice Age, even before you take account of the way the proportion of oxygen-18 in their shells is enhanced by the way plankton take up the water. The isotope technique, it was now clear, gave you, in effect, a measure of the global average temperature, no matter where in the oceans the core had been drilled. But they still needed a way to date accurately the temperature fluctuations that were now clearly apparent in the cores covering the entire Pleistocene Epoch. When more water is locked up in ice, the sea level falls; but when the ice sheets melt, sea level rises. Kukla had not invented this technique, although he was one of the first people to apply it to the study of past climates. It depended upon the discovery that the Earth’s magnetic field is not constant, but sometimes (seemingly at random) reverses itself entirely, first fading away to nothing and then building up again in the opposite sense, so that what is now the North magnetic pole becomes the South magnetic pole, and vice versa. The details of exactly how and why this happens are still not known, but it is clearly a result of the way the Earth’s magnetic field is generated, by swirling currents of fluid, electrically-conducting, iron-rich material in the deep interior of our planet. When reversals happen, they take place in less than 10,000 years (perhaps much less), so they show up sharply in the geological record; but once a particular orientation of the field is established, it may last for millions of years, or only for a few tens of thousands of years. The most recent reversal happened about 780,000 years ago, but the Earth’s magnetic field is weakening at the moment, so we may be living through the early stages of the next reversal. Since the temperature at the bottom of the sea hardly changes, even during the switch from an Ice Age to an Interglacial, this was the definitive proof that the main influence on the oxygen isotope composition was indeed the advance and retreat of the ice sheets on land, and that the isotopes were recording the pulsebeat of global climate change. It is concluded that changes in the Earth’s orbital geometry are the fundamental cause of Quaternary ice ages. A model of future climate based on the observed orbital-climate relationships… predicts that the long-term trend over the next several thousand years is towards extensive northern-hemisphere glaciation. They depend simply on the amount of heat which is required to turn ice at 0°C into water at the same temperature—the latent heat of fusion, which is (in the units used by Mason) 80 calories for every gram of ice melted. Since one calorie is defined as the amount of heat needed to raise the temperature of one gram of water by one degree Celsius, this means that the heat required to melt one gram of water at the freezing point is enough to heat that same gram of liquid water all the way from 0°C to 80°C. When you are melting glaciers, that adds up to a lot of heat, which is why Mason started the calculation expecting to prove that the change in heat balance of the Northern Hemisphere caused by the astronomical rhythms would not be sufficient for the task. A similar process operates in reverse when water vapour condenses into liquid or water freezes into ice. In each case, latent heat is given out by the water, rather than being taken up. When the vapour condenses into water at the same temperature, 595 calories of heat are released for each gram involved; so when the vapour goes all the way to the solid form and falls as snow, it liberates 675 calories for every gram of snow that falls. This heat goes into warming the surrounding air and the globe generally, while the need for heat to be absorbed in melting snow and ice tends to keep regions covered by winter snow cool well into early summer. Each year, we see the Ice Age cycle repeated in miniature. In the most extreme example of this chauvinistic approach, geologists set the start of the present epoch, the Holocene, at the beginning of the present Interglacial, 10,000 years ago. This is completely unjustified, since there is no evidence that the present Interglacial marks the end of the Ice Epoch that has persisted for the past few million years; the boundary is really chosen to mark the emergence of human civilization, as much out of hubris as chauvinism. But we will not be concerned here with anything that happened as recently as 10,000 years ago. The distinguishing characteristic of human beings is versatility. Some animals run faster, some are better swimmers, some have better teeth and claws for killing and eating meat, some have better teeth and digestive systems for eating plants, and so on. But people do a little bit of everything quite well. Without the astronomical rhythms of the Ice Ages, we would probably still be tree-apes. It was the repeated drying out and recovery of the East African forests that pushed our ancestors out on to the plains, forced them to become more versatile, encouraged them to walk upright rather than climbing on branches, and, almost as an afterthought, made us intelligent. Fully modern humans, Homo sapiens sapiens, emerged during the previous Interglacial to our own, by about 100,000 years ago, and had just one more Ice Age to endure before they began to build civilization. We are the product of the latest Ice Epoch, in a way that Agassiz, Croll and Milankovitch could never have guessed, and that realization is the ultimate triumph of the theory of Ice Ages. 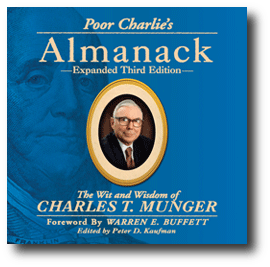 This entry was posted in Books and tagged Charlie Munger, Climate, Environment, Feedback Loops, John Gribbin, Mary Gribbin on September 4, 2017 by Blas. When speaking with management ask “If roles reversed, what would you ask if I were running your business? This entry was posted in Books and tagged Business, Charlie Munger, Finance, Investing, Mental Models, Peter Bevelin, Warren Buffett, Worth Re-reading on July 29, 2016 by Blas. This entry was posted in Books and tagged Business, Charlie Munger, Finance, Investing, Peter Bevelin, Warren Buffett on July 29, 2016 by Blas. This entry was posted in Books and tagged Business, Charlie Munger, Decision Making, Finance, Investing, Janet Lowe, Mental Models on March 29, 2016 by Blas. This entry was posted in Books and tagged Charlie Munger, Decision Making, Heuristics, How to Live Life, Mental Models, Mihnea Moldoveanu, Roger Martin on December 4, 2015 by Blas. This entry was posted in Books and tagged Charlie Munger, Decision Making, Finance, Heuristics, Investing, Mental Models, Tren Griffin, Warren Buffett on November 17, 2015 by Blas. A truly eye-opening book into the world and thought processes of Charlie Munger. He describes how and why he thinks the way he does, stresses the importance of learning the basics in the fundamental disciplines in order to avoid becoming “the man with a hammer who sees everything as a nail,” and how this has translated into the enormous success that is Berkshire Hathaway. Getting the incentives right is a very, very important lesson. The acquisition of wisdom is a moral duty. This entry was posted in Books and tagged Berkshire Hathaway, Charlie Munger, Decision Making, Finance, Investing, Mental Models, Peter Kaufman, Philosophy, Psychology, Worth Re-reading on May 4, 2015 by Blas.